Wedding day jitters are incredibly common. It's exciting and scary, like a roller-coaster two people are committing to riding for the rest of their lives. It can make for tons of intrusive and probably irrational thoughts, but those all melt away once a groom sees his partner at the end of the aisle. Of course, that’s not what this is about. This is about all the insane stuff going through his head beforehand. Really, more than anything, he’s excited to marry the love of his life, his best friend, his partner, and whatever else he might call you during his vows. There's about a 50/50 chance he cries during the vows. Even the manliest guy can get choked up. But of course, he's going to do his best to psych himself up and not shed a tear. Alternatively, he'll make himself cry so much beforehand so that there’s no other tears left. 3. I SHOULD SHAVE MY HEAD! At some point, it will occur to him that all the pictures of this day will live on forever in pictures hung on the wall in the most expensive frames you own. He'll pass these on the stairs, or in the foyer. Maybe they'll sit in the living room, watching him watch TV. It will occur to him that maybe his hair doesn’t look right, or that something needs adjustment. It's up to his groomsmen to talk him out of any last minute style changes, since you're not there. Maybe I should pee again just to see if there's anything left. It's very important that he doesn't pee or poop his pants while he's up there. Really, he's only got a handful of jobs up there: show up, get through the vows, and don't pee his pants in front of everyone he cares about. It's important he makes sure he goes to the bathroom beforehand. And if going to the bathroom beforehand is good, going to the bathroom eight times is better. 5. Is this what cold feet feels like? 6. Okay, just one more drink to calm the nerves. This is fine to think after the first drink. It's not as fine to think after the fourth, and hopefully someone is stepping in by the ninth. 7. I should drink and pee more. This just becomes a vicious circle of drinking to stay calm and peeing to make sure they won't need to during the ceremony. They say that some groomsmen get trapped in the cycle for all eternity, wandering the earth, peeing and drinking. 8. What if she doesn't show up? What if she gets KIDNAPPED? Beyond just worrying about his own problems, he's worried about what you're going through. Sure it'd be bad enough if you didn't show up. But what if you didn't show up, and he thought you got cold feet but really you were kidnapped. Alright, it's completely irrational, but he's about to get married. Nothing makes sense to him right now. 9. Oh, okay. So that's what a 'centerpiece' is. He's going to discover the meaning behind a lot of things he probably just said "yes" to during all the wedding planning. He may even realize he really did care what the centerpieces look like. 10. I should rewrite my vows right now. 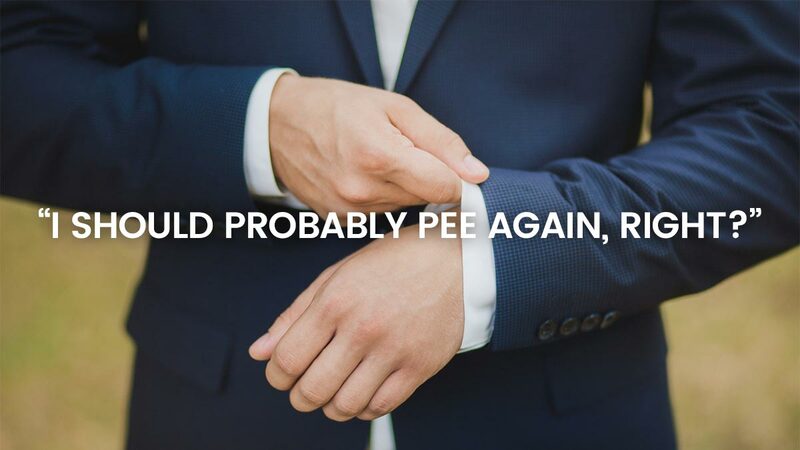 It is definitely not a good idea to be doing this 30 seconds before the ceremony, especially if he’s been doing a lot of peeing and drinking and freaking out.